Here is the rest of the gang. I got a little owl obsessed (or have I always been?) this spring and kept doing these little cuties. I’ve used about the same form and eye size on all of them, but it’s very fascinated how they all are so different and have their own personality, don’t you think? My favorites are the green owls, but I also very much like the applique one because it is a first try for a bigger work that I did for the embroidery exhibition, where we had a little bird theme going. You’ll see that some other later time, when I’ve taken photos of it. 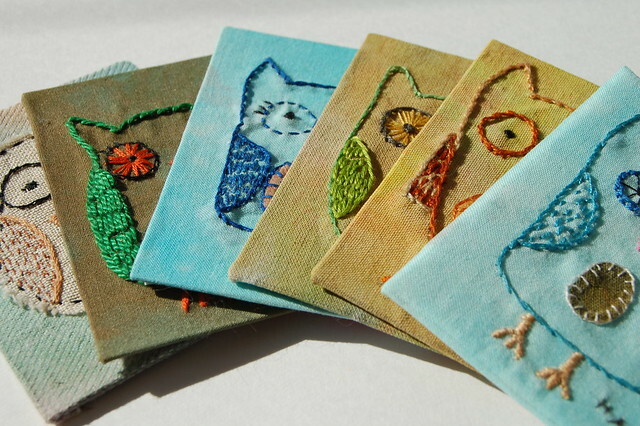 Thanks for all your sweet comments on applique owl and the blue owl! Uršula commented and asked how I do the backing, and a tutorial is coming up, probably next week. This entry was posted in Fabric Art and tagged ATC, embroidered atc, embroidery, on a theme, owls. Bookmark the permalink. Vilka jättefina ugglor! Det blir något visst när man upprepar en figur. Personligheten kommer fram. Caatje, most are already traded, and I’ve only traded embroidery for embroidery – they are a lot of work these ones! And some of them are “keepers”, I kind of fell in love with them and think they need to stay with their mama! ;-) Thanks for asking, maybe we can trade another time when I’m making paper ATC’s again. Oh my heavens these are all so awesome! Makes me want to pick up embroidery again. My favorite is the one on the top right corner! For some reason I’m loving the orange guy, upper right corner best. He looks like the wild party guy owl! How nice these are. No doubt the lower left is my favorite. Amazing all the things you are doing. Love them all, very adorable… nice work! I love these! And I love you’ve made so many of them. Oh, that one in the middle on bottom is my favorite! Så flotte ATC-kort med nydelige ugler. Ooh, these are too cute! I instantly fell in love with them…. ♥….. Thank you for sharing this, it does so much inspire me to try this, too. I just discovered your blog via the Craft newsletter and it’s amazing!!! I will become your newest follower. 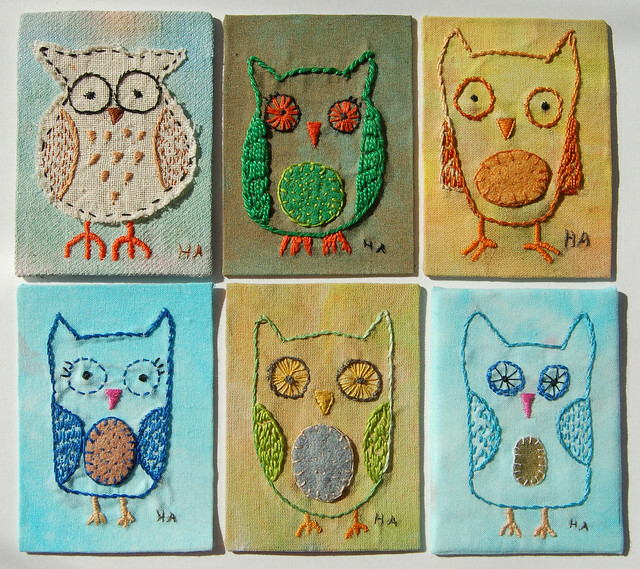 Love the owls…….and I’m fascinated with ATC’s. I def need to start a collection! :-) Thanks for the inspiration.